After a run of international whiskies, it seems about time to return to my first whisky love, Islay. 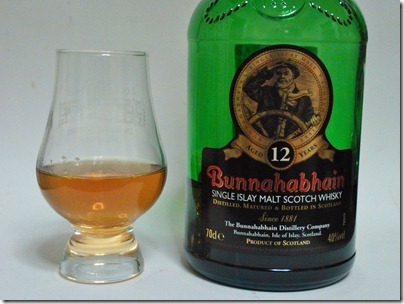 I must confess, when I first tried Bunnahabhain I was unmoved by it. That first taste came very early in my whisky education; perhaps lacking the huge smoke of Lagavulin or the playfulness of Bruichladdich I wasn’t ready to give it a fair taste. Happily, the last time we were in Islay for the Feis Ile I gave it another chance and realised my mistake and I added it to my ‘always in stock’ list. 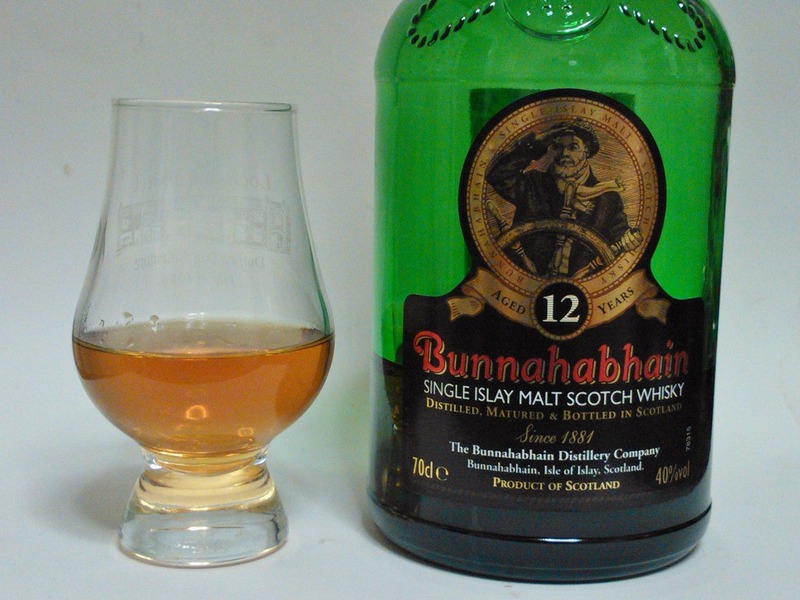 This is the Bunnahabhain 12 Year Old, their entry level whisky. Amber in the glass, light compared to the bourbons I’ve been drinking lately but still with some depth to it. A nice hit of alcohol on the nose, blending gently with a sweet vanilla aroma and a suggestion of the smoke underneath. Water reduces the alcohol heat and frees up the smoke – something I often find with the Islays. The sweetness is what your tongue first notices; as it sits and soaks into your tastebuds first the alcohol and then the smoke comes through, leading you through to a dry, generous finish. Water again tames the alcohol and allows both that sweet, almost fruity start and the smoky tail to come through stronger. It also robs the whisky of a little body; I’m torn as to whether this is better with or without water. This is a proper drinking whisky; complex enough to savour, but dangerously drinkable at the same time. Wonderful stuff. Heading to Islay over Easter but unfortunately Bunnahabain will be off on holidays. I’ve had the 12 y/o before but in a non critical context but remember it being pleasant enough. Will maybe get a dram in the Bowmore Hotel. I’ve always found it a bit sweet for my taste, as well as being a little, well, dull. That was pretty much how I’d remembered it too; I’m glad I gave it another chance.. Interesting – it’s a bottle I’ve managed to keep going since we were last there a couple of years ago. Now I’m going to have to buy one of the relaunched bottles while I still have the old stuff, and do a comparison!